Access to festival highlights for Friday, August 23, 2019, including: all day access to festival sites*, dockside viewing of 10+ tall ships*, live music/entertainment, educational seminars, children activities, beer garden, food vendors, vendor marketplace. *DOES NOT include access onto ships for deck tours. Purchase Friday Deck Tour Add-On for access onto available ships for deck tours. MUST be purchased with a Friday Single Day Pass above. Experience deck tours on available vessels - see real tall ships up close and meet crewmembers! Access to festival highlights for Saturday, August 24, 2019, including: all day access to festival sites*, dockside viewing of 10+ tall ships*, live music/entertainment, educational seminars, children activities, beer garden, food vendors, vendor marketplace. *DOES NOT include access onto ships for deck tours. Purchase Saturday Deck Tour Add-On for access onto available ships for deck tours. MUST be purchased with a Saturday Single Day Pass above. Experience deck tours on available vessels - see real tall ships up close and meet crewmembers! Access to festival highlights for Sunday, August 25, 2019, including: all day access to festival sites*, dockside viewing of 10+ tall ships*, live music/entertainment, educational seminars, children activities, beer garden, food vendors, vendor marketplace. *DOES NOT include access onto ships for deck tours. Purchase Sunday Deck Tour Add-On for access onto available ships for deck tours. MUST be purchased with a Sunday Single Day Pass above. Experience deck tours on available vessels - see real tall ships up close and meet crewmembers! Save 15% and come through the entire festival weekend! Includes festival highlights AND deck tours on available ships for the entire festival weekend August 23 - August 25, 2019. Weekend Passes are non-transferable. Day Sail tickets sold separately. Includes festival highlights AND deck tours on available ships for entire festival weekend August 23 - August 25, 2019 as well as access to all VIP only hospitality areas. VIP areas may include complimentary refreshments and hors d’oeuvres. VIPs also receive VIP Line access and VIP Parking. VIP Passes are non-transferable. Day Sail tickets sold separately. Help us continue bringing tall ship sailing to Erie by making a voluntary donation to the Flagship Niagara League. All tickets are priced per person, per day (except Weekend Pass & VIP Pass). Children under 2 are free. We highly encourage purchasing at least Weekend Pass(es) to get the most out of the festival. Lines to tour some of the ships can be very long (2+ hours) and there are many ships to tour and other activities at the festival! Tall Ships® Erie is a rain or shine event. All tickets are final sale. No refunds or exchanges. All day access to festival sites. *DOES NOT include access onto ships for deck tours. Purchase Deck Tour Add-On for access onto available ships for deck tours. Dockside viewing of 10+ tall ships. *DOES NOT include access onto ships for deck tours. Purchase Deck Tour Add-On for access onto available ships for deck tours. Day Sail tickets sold separately. MUST be purchased with a corresponding Single Day Pass. Enhance your festival experience by experiencing deck tours on available vessels - see real tall ships up close and meet crewmembers! 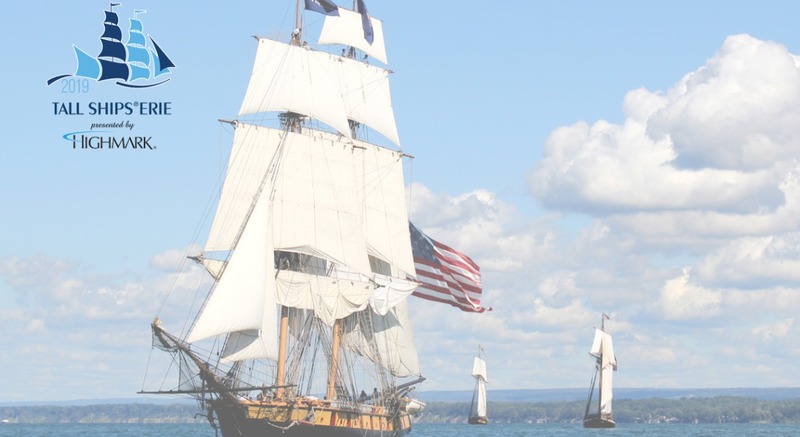 FESTIVAL SECURITY MEASURES: Tall Ships Erie has been designated as a Marine Event of National Significance by the United States Department of Homeland Security. This designation requires certain security measures to be in place for the public’s safety. Individuals must possess an approved ticket, wristband, or credential to gain access into the event. All personal belongings, bags, and purses will be checked. Large backpacks are not permitted. Firearms, weapons of any kind, explosives, or incendiary devices are not permitted. Selfie sticks are not permitted. Bottles or containers of any kind of water or other liquids and food are not permitted. Baby food and formula must be stored in plastic containers. Glass is not permitted. Small coolers no larger than 5 quarts will be permitted to utilize for baby food/formula and medicine only.